There's still no official Uber IPO date, and we may now have to wait even longer than anticipated. Here's why: A judge rejected a proposed $100 million settlement on Aug. 18 between Uber and drivers in two states, according to The Wall Street Journal. And this rejected settlement means Uber's profitability is in significant danger. You see, instead of just paying a one-time settlement of $100 million, the rejection means Uber may have to pay $4.1 billion annually. On April 21, Uber reached a $100 million class-action settlement with drivers in Massachusetts and California who were seeking full-time employment status. Uber agreed to pay $84 million to plaintiffs in those states, and an additional $16 million would be awarded if Uber goes public. Uber will publish a handbook that explains its driver deactivation policy. Before, Uber could just deactivate drivers without explanation. Uber drivers can display signs in their vehicles asking for tips. Unlike rival Lyft, Uber does not have an option on its app for passengers to tip. Uber seemingly came out on top. But on Aug. 18, U.S. District Judge Edward Chen rejected the settlement of the two Uber lawsuits. He said the settlement wasn't accurate, fair, or reasonable for drivers. Judge Chen's objection to the ruling was that drivers could not pursue other claims against Uber under the current settlement. According to ABC News, Judge Chen believes plaintiffs in the California/Massachusetts lawsuits could have been awarded another $1 billion in a trial. It's true that this lawsuit is just in two states. But the ramifications are much bigger. If drivers in California and Massachusetts set a precedent of winning full-time employee status, the ride-hailing company would be facing major problem. In fact, it's a problem that could cost the company a whopping $4.1 billion every single year…. If Uber has to classify its drivers as full time, the company could go bankrupt and an Uber IPO date may never be set. You see, Uber is profitable in North America because of its current business model. According to Yahoo! Finance, Uber made profits of $0.19 per ride in February 2016. With 50 million rides booked in the United States in March, that's a potential profit of $9.6 million for one month in just one country. That's a total of $4.1 billion annually, and that total cost would only increase as Uber hires more drivers. 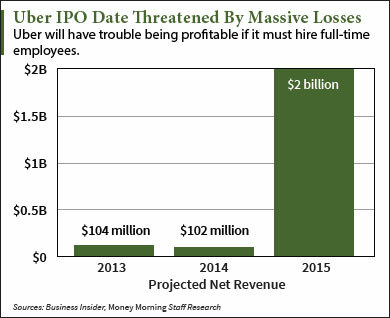 As you can see from the graph below, Uber's revenue is nowhere close to covering the expense of full-time employees. On top of that cost, Uber could lose even more money now that it has to compete with Tesla Motors Inc. (Nasdaq: TSLA) for customers. On July 20, Tesla CEO Elon Musk announced his newest "Master Plan" for his company. There's no timetable, but Musk wants to turn Tesla cars into self-driving taxis. While Tesla owners are at work or not using their cars, they could use their cars to pick up passengers and earn money. If just half of the 400,000 who ordered the Tesla Model 3 turned their cars into a taxi, that's 200,000 new competitors for Uber. Musk also wants to start his own Tesla-owned fleet of ride-sharing vehicles. The Bottom Line: The Uber IPO date may never happen after a judge rejected Uber's settlement with drivers in California and Massachusetts. If Uber is forced to classify its drivers as full-time employees – a potential cost of $4.1 annually – then it won't make enough money to stay in business. On top of that, Uber has increased competition from Tesla Motors. Up Next: Is This TWTR Stock Price Slide a Buying Opportunity?